This nearly new home has it all: 4 LARGE bedrooms with possibility for 5th, 3.5 baths, first floor master with walk in closet and en suite master bathroom, eat in kitchen with stainless steel appliances and deep cherry color wood cabinets, pantry and plenty of counter space, living room with a complete wall of floor to ceiling built in cabinetry, fireplace, walk out basement, lots of storage space. The kitchen opens onto a deck perched high above the fall away lot, giving a tranquil view of the back yard and creek. 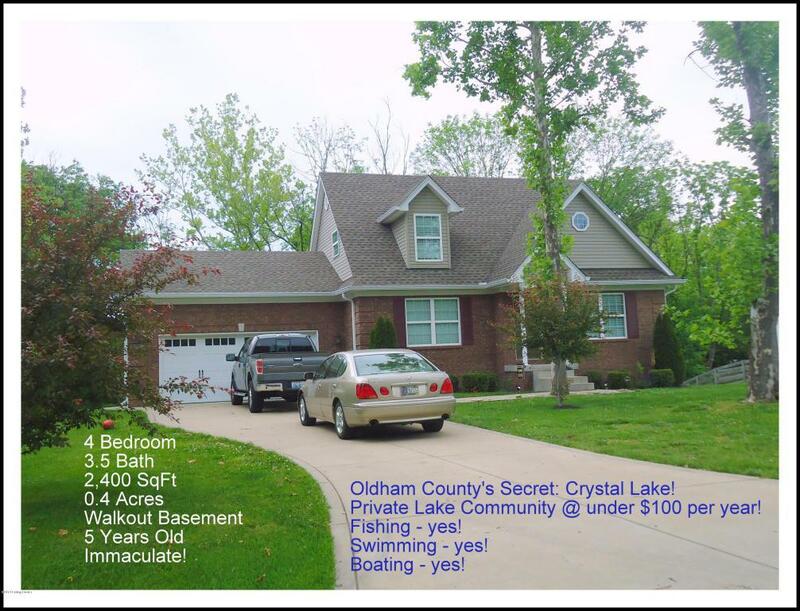 Crystal Lake subdivision has a residents only massive lake where you can spend the summer boating, fishing and swimming for a HOA fee of less than $100! http://ourcrystallake.org/index.htmlOldham County's Award Winning School System.Call today!